150th Irish Derby School’s Art competition. Kildare Library and Arts Service, Curragh Racecourse and Riverbank Arts Centre launch the 150th Irish Derby School’s Art competition. To coincide with the 150th running of the Irish Derby, The Curragh Racecourse, Kildare Library & Arts Service and Riverbank Arts Centre are delighted to launch a school’s arts competition aimed at both primary and secondary school students in County Kildare. Closing date for entries is Friday the 27th of March. Winners will be announced on Monday the 11th of May. All winning entries will be exhibited in Riverbank Arts Centre throughout June prior to the prizes for the winning entries being presented at the Curragh during the Irish Derby Festival. The Dubai Duty Free Irish Derby Festival takes place at the Curragh from 26th to 28th June with the 150th Irish Derby the highlight of the weekend on Saturday 27th June. 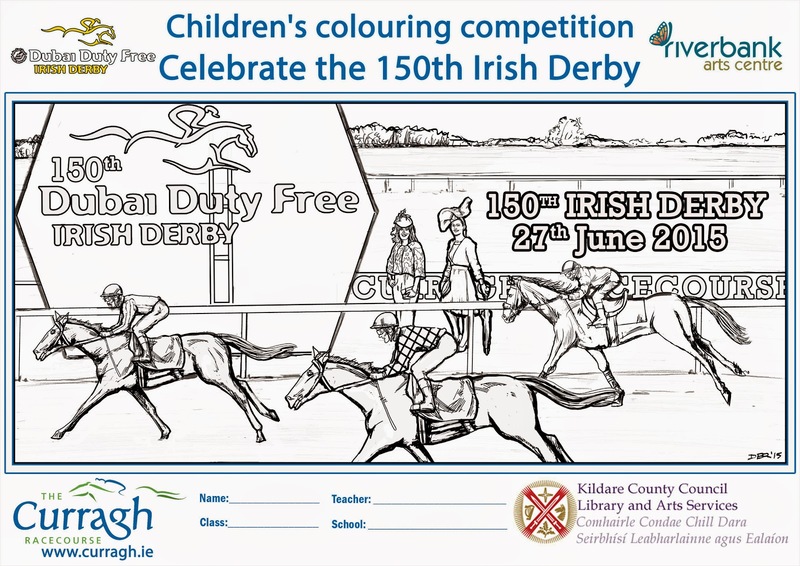 All primary children will receive a “150th Irish Derby theme” illustration to colour. 2. 4th to 6th class. The overall winners will receive top of the range art sets plus a €100 voucher. There will also be prizes for 9 runners-up in each category. Also, as part of the prize, the class of both winners will enjoy a workshop with leading illustrator Dave Butler together with a €500 voucher for art supplies and a variety of books for their school library. All entrants will receive free admission to the races on 28th June, while the parents can avail of a special discounted family ticket for the Irish Derby Festival Family Fun Day on Sunday 28th June. All secondary school students will be invited to design an A3 poster with a 150th Irish Derby theme. All 10 winners and their families will be invited to the races on 28th June as guests of the Curragh, while the class colleagues of the overall winner will receive 2 complimentary tickets to the races. The 10 winners in the category will also have their posters printed in the official Derby Festival programme. Judges include artist Chara Nagle, illustrator Dave Butler, Eoghan Doyle, Assistant County Arts Officer, Marian Higgins and Celine Broughal of the Kildare Library & Arts Service and Evan Arkwright, Commercial Manager of the Curragh Racecourse. Entries may be posted directly to, or handed in at your local library. Closing date is Friday 27th of March 2015.